Russia’s first ever World Aquatics Championships finished on Aug. 9 in Kazan. While the competition was dominated by the U.S. and China, the Russian team won nine golds, four silvers and four bronzes to finish third. RBTH reports on the most memorable moments of the event. The FINA World Aquatics Championships – hosted by Russia for the first time – ended in Kazan on Sunday, Aug. 9 with a respectable showing for the host nation. Russian athletes took third place in the team event, winning nine gold, four silver and four bronze medals. China (10-10-14) and the U.S. (12-14-6) came first and second. Each of the top three teams had its own trump cards. For Russians, it was synchronized swimming (8 gold medals out of 9), for the Chinese it was diving (11 wins out of 13), while the Americans dominated swimming events (7 gold, 10 silver and five bronze medals out of the 42 sets of medals). 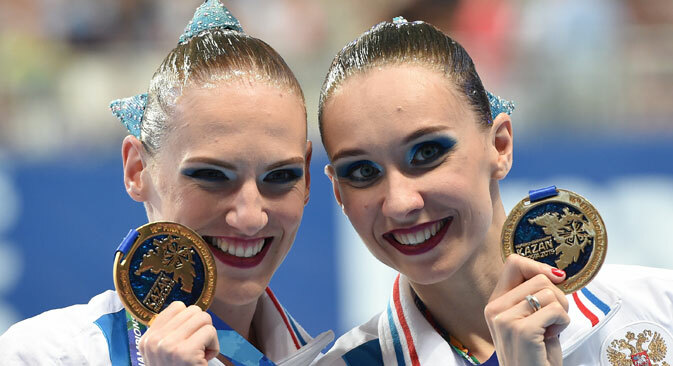 The eyes of both synchronized swimming fans and specialists in this sport were glued to Russian swimmer Natalya Ishchenko, who had only returned to the sport in November 2013 after taking a two-year break from her career to give birth. In Kazan, Ishchenko won three gold medals and became a 19-time world champion. “Of course, it was difficult to come back, but giving it all – not even 100, but 200 percent – is never easy. People are always waiting for something new, interesting, and unbelievable from the Russian team as the leaders. And we keep the bar high,” Ishchenko told RBTH. Perhaps only the mixed duets could compete with Ishchenko for the attention of the local fans. The main contenders were Russia's only male synchro swimmer, Alexander Maltsev, and the world's most famous male synchro swimmer, Bill May of the U.S. –and, of course, their female partners. None of them left Kazan without gold. “We deliberately chose The Firebird, a ballet by Stravinsky. This theme should be close to Russians. And, of course, we really liked the performance of the Russian duo. Maltsev is a very talented guy. For both of us this championship was a special moment in life,” said May. In diving, the Chinese were defeated only in two categories. Tania Cagnotto of Italy won gold in the one-meter springboard and North Korean teenager Kim Kuk-hyang triumphed in the 10-meter diving. While they certainly contributed to the story of the championship, the diving events will be remembered for the utter dominance of the Chinese athletes. “The final was incredible, very interesting and exciting. I had seen the results of Zakharov, but did not think about them. I am grateful to the audience for their support. The atmosphere in the Aquatics Palace really helped me today,” said He Chao, who became world champion in the three-meter springboard, beating Russia's Olympic champion Ilya Zakharov. A total of 12 world records was established during the swimming tournament in the Kazan Arena swimming pool. Three of them, as well as five gold medals in the 200 m, 400 m, 800 m and 1500 m freestyle and the 4 x 200 m relay, were set by 18-year-old American Katie Ledecky. “It felt pretty easy,” said Ledecky after her record 1500 m swim in comments reported by various news agencies. “I was so relaxed. I realized just towards the end as I could see people waving [...]. It’s one of the coolest world records I’ve broken,” she said, giving credit to the spectators in Kazan for their support. Russia was not left out of the gold medal party completely: Fans got a gift, even if a small one, from Yuliya Yefimova, who brought in the team's only gold medal, beating ex-champion and former world record holder Ruta Meilutyte of Lithuania. “It was good to swim, the stands helped a great deal. This is something unreal. My friends made posters and T-shirts to cheer for me. Even if you do not want to swim fast, you have no choice,” said Yefimova.